Flightradar24 shows live air traffic from around the world. 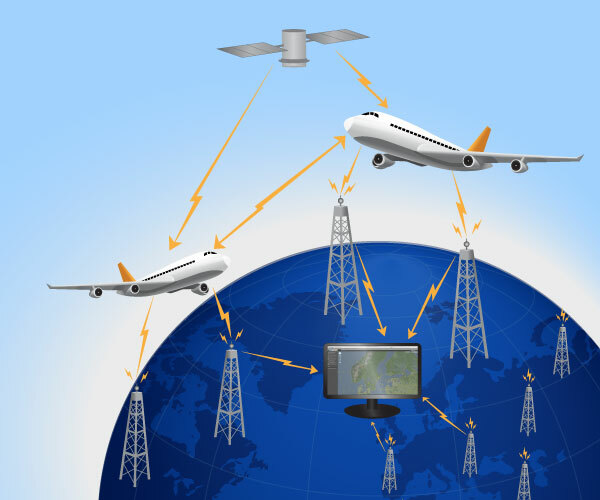 The primary technology they use to receive flight information is called automatic dependent surveillance-broadcast (ADS-B). Flightradar24 has a network of about 500 ADS-B receivers across the world that receives plane and flight information from aircraft and sends this information to a flightradar24 server, and then displays this information on a map on Flightradar24. Only aircraft with an ADS-B transponder, within the coverage area of the 500 receivers are visible. Flightradar24 only have coverage in areas where someone has installed an ADS-B receiver and feeds his/her data into Flightradar24. If there are no connected ABS-B receivers in an area, then there is no coverage in that area. In addition to ADS-B data, we also display data from the Federal Aviation Administration (FAA). This data provides full coverage of the airspace above the United States and Canada. Flightradar24 relies on volunteers around the world for the majority of our coverage. Find out how you can contribute. In addition to ADS-B data, They also get data from the Federal Aviation Administration (FAA) in the United States. This data is based on radar data and includes all commercial air traffic in US and Canadian air space (i.e. not just planes with ADS-B transponders). Unlike the ADS-B data that is presented real-time, the FAA data is delayed by roughly 5 minutes due to FAA regulations. On the Flightradar24 map, all planes based on FAA data are orange. There are lots of exceptions. For example one Lufthansa CRJ900, one LOT ATR-72, one Wideroe Dash, some MD8X from Onur Air, some Saab 340 in Australia and several private Cessnas are visible. There are also some older A300, A310, A320, B737, B747, B757, B767 aircraft flying without and ADS-B transponder, which make those aircraft invisible on Flightradar24.